Hey, little toad, get out of the way! You could get hurt. That’s no place to play. What do you think your mama would say? The final animal is the toad’s mama! And she’s driving a tow truck to take away the other crashed vehicles. They smile when they see each other, and she gets him off the road with a hug. 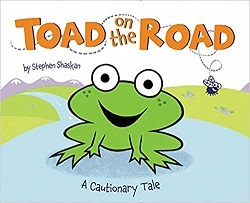 There are little blips where the rhyme isn’t perfect – but my main impression of the book is that I have to try it at my next Toddler Storytime. I can’t wait to have everybody shout, “Look out! Look out!” And the bonus is that it’s a fun way to talk about how the road is not a safe place to play. This entry was posted on Thursday, July 5th, 2018 at 10:45 pm and is filed under Animal Characters, Delightfully Silly, Picture Book Review, Readalouds. You can follow any responses to this entry through the RSS 2.0 feed. You can leave a response, or trackback from your own site.